Day one: Heathrow: several huge trolleys glide towards me piled up with crates and boxes. The Garden Opera Company – seven singers, five players, two stage crew, one sound technician – and everything – microphones, sound desk, costumes, props (including the kitchen sink) – assembles for the night flight to Nairobi. Garden Opera is a small scale touring company, known for its unstuffy approach and ambitious touring schedule that takes it to far-flung corners of the UK each summer. I first met them in 2001, when they performed my translation of L’elisir d’amore. Other works with them followed, including a commission to translate Rossini’s La Cenerentola. Intrigued by the reports of their two previous trips to Kenya with Carmen (the first opera production ever seen in Kenya) and Don Giovanni, I have jumped at the chance to join them on their third trip, with Cinderella. Day two: The Stanley Hotel in Nairobi is redolent of old ‘Keenya’ with its Baden-Powell, Hemingway and Huxley rooms. The band and four soloists are rehearsing the Mozart Requiem with the Nairobi Orchestra and Music Society Choir; the rest of us are trying out the pool and the Tusker beer. The Company is here to take part in the music festival run by the Kijani Kenya Trust. Kijani, in Swahili, means ‘green shoots’ and this British-based charity, set up by the enterprising Lis Woods, raises money for HIV/AIDS work and environmental projects. — enthuse about a music-theatre workshop they have been running for students from Kenyatta University. Day four: Our bus goes north to Nanyuki, where I watch Peter rehearsing 50 school children aged 5-13 for their opera debut in Cinderella. They will sing the courtiers’ chorus and deliver invitations to the Prince’s ball. football stadium then, as a torrential storm begins, drive to Ol Pejeta where a tented camp has been specially constructed for Garden Opera to stay in. Sadly we find the rain has rendered it uninhabitable: the company huddles in one tent, but several [italics] dei ex machine [roman] appear and carry us away to the Sweetwaters Camp, which is paradise on earth. cottage hospital at Nanyuki to visit the discreet VCT (Voluntary Counselling and Testing for HIV/AIDS) centre. Our return briefly halted by zebras crossing, we drive along the new road (signposted “OPERA”) to the Ol Pejeta performance venue where the company is to perform Cinderella. As we arrive, the stage (constructed for £150), is going up, Cinderella’s kitchen sink is ready. The chairman paints the set and the librettist irons the costumes. The performance goes without a hitch, the children are stunning (on only two rehearsals!) and the sound system is great. As the whole cast launches into: “But I have a dreadful feeling that an awesome storm is brewing…” in the great finale to Act I, when the mysterious beauty has just arrived at the ball, black clouds gather overhead, but the rain holds off. The Information Minister gives a speech, telling us he has seen opera in London and Berlin, but had much enjoyed not having to read a board above the stage to understand what was going on. Day six: We are luxuriously accommodated at the Mount Kenya Safari Club, on the equator, founded by the actor William Holden (no relation). I hope their refurbishing plans don’t mean the old-fashioned charm will be swept away. Day seven: In the garden of the original Forester’s house at the100 year old Nairobi Arboretum, adjoining the President’s residence, hundreds of school children arrive for the matinée, umbrellas raised to protect them against the sun. The show starts with the University students’ project, a 20-minute piece of music theatre about personal responses to AIDS. It is witty and unbearably moving; the natural musical and acting talent is remarkable. During Cinderella, a squabbling flock of speckled mousebirds almost upstages Prince Ramiro’s entrance. Day eight: The company has a day off. We feast on grilled ostrich, camel and crocodile at the aptly names Carnivore Restaurant, then proceed to see rescued Rothschild’s giraffes and the David Sheldrick elephant orphanage on the edge of the National Park. Several members of the company are suddenly foster parents. Day nine: A Mozart rehearsal resounds through the Grand Regency Hotel. The band then disappear to the Conservatoire to run master classes. They return overwhelmed by the utter enthusiasm amid utter privation of shared instruments, too few teachers and no one-to-one tuition. Tonight, in the colonial comfort of the Muthaiga country club (where Karen Blixen met Denys Finch Hatton), the Venezuelan pianist Elena Riu presents an eclectic programme at a fund-raising dinner in a marquee. Torrential rain defeats the canvas and forces both guests and the Lucia Alvarez Flamenco Group to complete the concert indoors. Day ten: At the second, evening, performance at the Arboretum the environment minister and the Hon Charles Njonjo, formerly a member of Kenyatta’s cabinet, attend. Njonjo is helping to negotiate the lease from the government of the garden as there are plans to build a 1000-seat amphitheatre there, the first of its kind in Kenya, to be used for all kinds of public performance. Day eleven: We fly to the coast — great views of snow-capped Kilimanjaro. On the beach the temperature soars above 40 degrees. 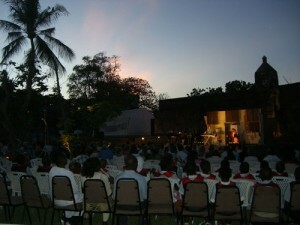 There are to be two performances in Mombasa at Fort Jesus, the magnificent but crumbling 16th-century Portuguese fort in this Arabic town. As the sun sets the Garden Opera troupe perform their party pieces, popular arias and Mozart’s Piano Concerto K414; the music director coaxes a lyrical performance out of an electric keyboard. announces that his company will support the construction of the amphitheatre at the Nairobi arboretum. All profits from performances there will go to the Kijani Trust.